Photography by Roberto Mighty; From left: Verna Hampton, Kerline Desir, Thomika Marie Bridwell, Dayenne CB Walters, Karimah Williams, Tonasia Jones. Not pictured: Ciera-Sade Wade. (Boston, MA) When theatre is about lifting up oppressed voices, it is a revolutionary act. Praxis Stage’s production of “for colored girls who have considered suicide/ when the rainbow is enuf” during Black History Month qualifies. I recommend that locals go and see this production if they can. Although “for colored girls . . .” is done regularly with student casts, such as the production at Boston College in 2014, it is inspiring to see a range of ages authentically represented in this show. I will also mention that the space in Hibernian Hall is accessible, which is not always a possibility for theatre companies in the Boston area. Domestic violence, post traumatic stress disorder, and sexual assault are explored from the viewpoints of survivors. As such, it may be difficult for an audience member who may be a survivor to sit through one or two of the pieces. At the performance I was at, one or two of the audience members did leave during difficult pieces and returned. There is no intermission and the runtime is about an hour and a half. There were quick transitions between each piece, such that discomfort may last for five to ten minutes at most for folks who may not be triggered. A white person’s perspective is never referenced in this show by the performers. That is intentional. Ntozake Shange’s choreopoem is explicitly about the experience of African American women, as she is an African American woman, and the writing reflects her experiences. The audience was very mixed in race and age, which I think we in Boston we would see more of, if companies in Boston were to support and create more Black centered works. Kudos to both the director Dayenne CB Walters (double duty as Lady in Yellow) and the choreographer W. Lola Remy for creating blocking and dance that fills the entire space, not just the stage area. Occasional lighting changes and music cues assist the performers as they tell stories through movement and the spoken word. The voice of Verna Hampton (Lady in Brown) was an enchanting instrument. Although this was a true ensemble piece, I found myself relaxing into this sound during different poems. The energy of Kerline Desir (Lady in Red) brought several of the pieces she starred in to crackling climaxes. All good things come in sevens: each member of the ensemble emerged from the crowd but also spent a good deal of energy while portraying secondary and background characters. Choosing to present this groundbreaking work centered around the Black Female experience in America at this time is an emotional step forward for Praxis Stage now in its second season. Next up for Praxis Stage is “The Plague” by Neil Bartlett, an adaptation of Albert Camus’ novel La Peste, in May. 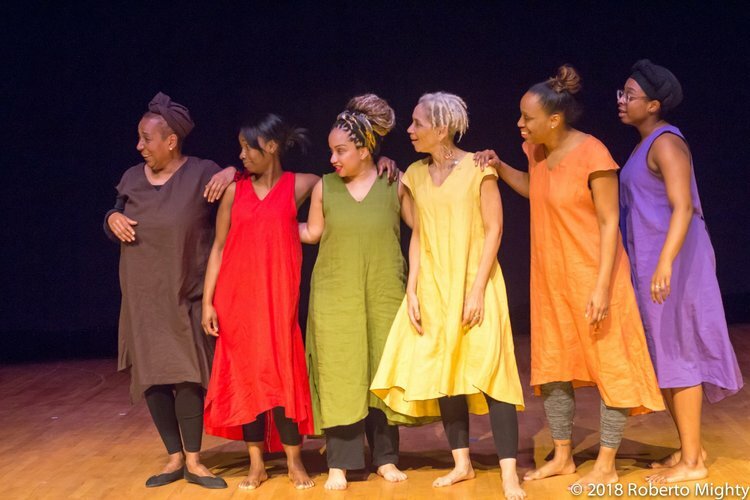 This entry was posted in Drama and tagged 2018, Black History Month, Boston, Ciera-Sadé Wade, Dayenne CB Walters, domestic violence, February, Hibernian Hall, Karimah Williams, Kerline Desir, MA, Noelani Kamelamela, Ntozake Shange, post traumatic stress disorder, Praxis Stage, Roberto Mighty, sexual assault, Thomika Marie Bridwell, Tonasia Jones, Verna Hampton, W. Lola Remy by Noe Kamelamela. Bookmark the permalink.